I had the incredible good fortune of playing in Jeff’s rock / blues band for the last five years of his tragically short life. From the earliest days of Jeff’s fame, we were so blessed here in Toronto not only to have such a genuine international star, but even more so a truly great musician of such profound substance and depth. I had always aspired to perform with Jeff, and simply to play alongside him as a guest performer, let alone working with him regularly, was a dream come true. In the course of working with Jeff on stage and getting to know him off stage I became even more impressed by his powerful personality, and admired how his unique traits surely must have shaped the amazing musician he had become. Of his many qualities, what summed up Jeff best for me was this: He was up for anything! When I first started working with Jeff’s house band at his eponymous Healey’s nightclub in Toronto, every Thursday night our job was to open the show for the first set, and then jam with Jeff and special guests during the second set, and then usually continue to jam with Jeff during the third set as well, because most of the time Jeff never wanted to leave, even though he wasn’t expected to stay after the second set. On just my second week our special guest was Steve Lukather, an incredibly thrilling (and intimidating!) experience. Jeff had many such stars join him at Healey’s whenever they were in town, but just as frequently Jeff had local musicians join him as special guests, and Jeff was equally enthused to play with them. I know that the opportunity to perform with Jeff is something special that so many musicians in the Toronto musical community will always be grateful for and will never forget. Jeff simply loved to play anywhere at anytime – he was up for anything! And so it was whenever we were on the road, after a concert Jeff was often happy to join our band in late night searches for a bar with some live music. Even though he wasn’t drinking Jeff would have just as much fun as the rest of us in our quest, and the night would inevitably culminate in Jeff getting on stage with whatever band we had happened to find. If you have known a lot of guitar players you will know how obsessed many guitarists are with having just the right sound, the right guitar, the right pedals, the right amp, etc. etc. and so it was always all the more amazing that Jeff would fearlessly get on stage with whatever type of gear the local guitarist happened to be using, would have no plan of what songs to perform, and still sound absolutely incredible! Jeff really didn’t need to rely on equipment because there was so much great music in his hands and in his head. Although Jeff was happy to join us on our late night pub crawls, I was even more amazed that if everyone was just staying put at the hotel and Jeff still wanted to go out for some reason, he was not adverse at all to simply venturing out on his own without anyone to guide him. In spending time with Jeff it was really amazing the degree to which he didn’t let his blindness slow him down in the slightest, and he handled what would be a major disability for anyone else with a style, grace, confidence and determination that was really something to behold. Jeff also had a real sense of humour about being blind (and everything else!) that put everyone at ease. He was an incredibly funny, down to earth guy who loved to laugh. When we were on the road we alleviated boredom with ridiculous pictures we would take to keep ourselves amused. 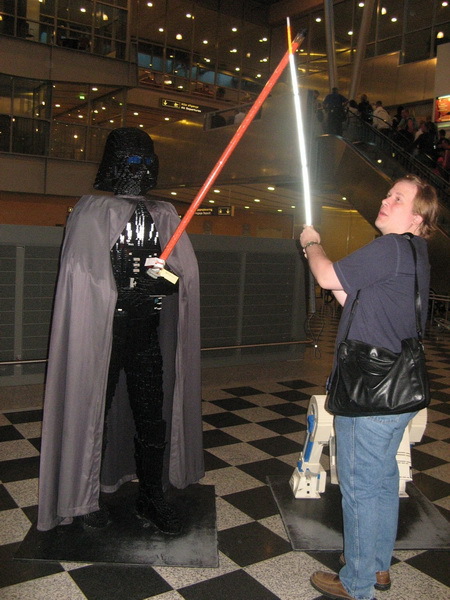 This picture of Jeff doing battle with Darth Vader in some European airport is one of my favourites! While working in Jeff’s band I was always quite taken aback by the total lack of preparation he seemed to genuinely prefer in his bandmates. When we started to perform with Jeff on the road he was quite insistent that he didn’t want us to learn or study any of his hits we would be performing. I was a little puzzled by this, but one day he explained to me he liked to be ‘surprised’ when he was playing with other musicians. And so it was that it became almost a sport to constantly play songs with Jeff that we had never rehearsed, planned or even discussed. Jeff had a real joy in constantly being challenged onstage with new material to play, and it was amazing that no matter what song or genre you threw at him, Jeff was truly unstumpable! One of my absolute favourite memories with Jeff was playing at a large music festival in Western Canada. Jeff was an incredibly generous bandleader. Even though everyone who attended his concerts was obviously there to see Jeff, he was nevertheless always wanting to share the spotlight with his band, and was happy to give more than equal playing time to incredible guitarists like his bandmates Pat Rush and Dan Noordermeer. Likewise Jeff would often ask me to sing lead on several songs during his shows, and in typical Jeff style we never had any set list or plan as to what we would perform live. So on this particular occasion when Jeff asked me to play a song, I surprised him by making an unusual song choice in ‘Sundown’ by Gordon Lightfoot. We had never played the song together at all and I wasn’t even certain if Jeff knew it or not (but of course he did!). For some reason it was a particularly inspired, magical performance and the audience went crazy for it. At the time I was struck by how such a wonderful, spontaneous moment could have only happened under the auspices of Jeff’s leadership, and the fact that he was totally open to playing absolutely anything at any time made for countless other memorable nights. When Jeff became ill towards the end of his life I was always struck by how he seemed to pour even more of himself into his music, at a time when he certainly had less of himself to give. His illness was very serious, and we all knew his situation could be grave. But even in this diminished capacity Jeff put out an astonishing amount of work in the last few years of his life. He clearly had a lot to share with us and we are so lucky he shared as much as he did while he still could. For Jeff’s album Mess of Blues, I was once again astonished by the degree to which he wanted the recording to be absolutely spontaneous, and in practice this meant our band simply showing up at the studio with no clue as to what he wanted to record. Once in the studio Jeff would briefly discuss the outline of various songs he had selected, and then the engineers would hit record and we would play! Initially this seemed an incredibly counterintuitive way to make a record, and I personally believed things could be so much better if we planned, rehearsed, overdubbed, edited and so forth. But ultimately I came to understand in a way he already knew that this was the true way to capture the real spirit of the band and Jeff in the moment. 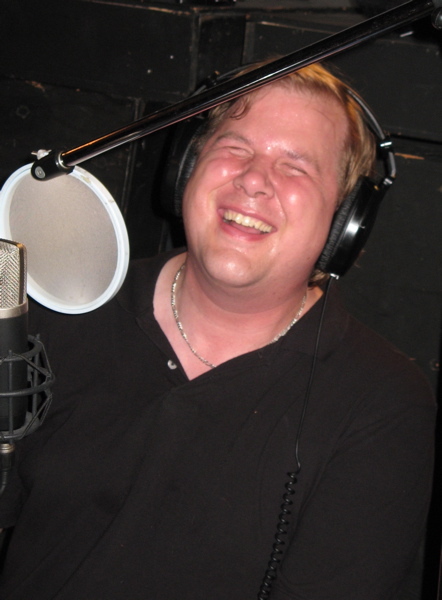 This picture of Jeff laughing in the studio is the way I love to remember him. These special times and so many more were moments I had truly hoped would never end. Had he lived I’m certain Jeff would have continued to grow even greater as a musician, and I imagined him continuing to perform worldwide throughout a very long life as a beloved musical ambassador, very much like B.B. King, but so sadly it wasn’t to be. Even so, like many others I feel incredibly grateful for the brief time we had together. Jeff had musical depth like an ocean. Even after years of playing with him he still continually found new ways to astonish me with previously unheard musical ideas. Jeff was so disciplined as a guitarist and so adverse to overplaying that he would very rarely solo more than three times around the form in a blues tune, even though he had a thousand times as much to say musically as so many other guitarists who might endlessly solo in the same format. But at the end of every concert Jeff would finally open up the floodgates and really let loose for his closing solo cadenza in ‘See the Light’. These solos were always different, improvised, and just jaw-droppingly fantastic. No one in the world plays like that – Jeff was truly one of a kind. I consider myself the luckiest guy to have had a front row seat right on stage for one of the greatest musicians ever. 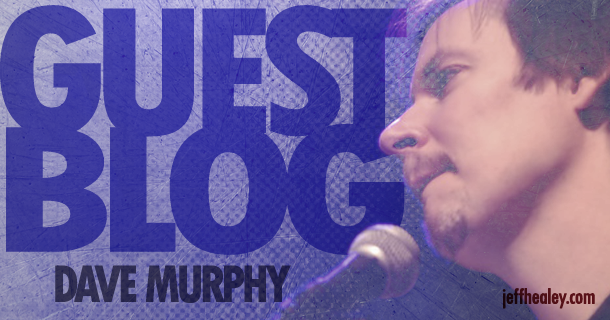 Dave Murphy is a truly gifted performer who was a lynchpin in the ‘Healey’s House Band’ (aka ‘Jeff Healey Blues Band’). His playing (and singing) can be heard on Jeff’s ‘Mess Of Blues‘ and ‘Songs From The Road‘ albums and the Dave Murphy Band (featuring JHBB alum Dan Noodermeer on guitar) still performs a regular Friday night house gig to *jam packed* crowds at Toronto’s legendary Orbit Room. If you’re in town, pop by and show him some much deserved love will ya? Thanks Rog. and thanks to Dave for the great talk on Jeff. It is so nice to hear what others saw in Jeff as a person as well as a Musician. Jeff always wanted to be known as a Musician above anything else he might have been known for. Jeff never let his blindness interfere with what he wanted to do even as a young boy. What a gift he was to his Mom and I. God always works in mysterious ways. Bud. Thank you, Dave, I totally agree. Jeff was one of his kind, there is no one to replace him. It is so unfair he had to die so young. I miss him and his playing awfully much. Thanks Dave, Jeff allowed everyone into his life including myself. UNSELFISH!!!! 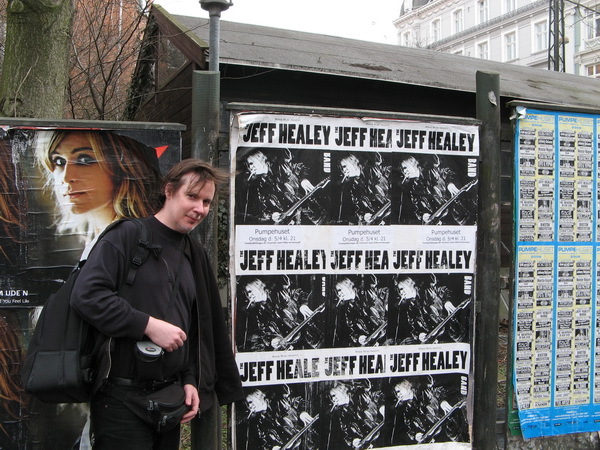 Thanks so much for the wonderful memories you have of Jeff,I too feel the same,and I’m only a fan.A volunteer D/J in Community Radio in Australia for 20 years,Jeff has always been a big part of my Rock/Blues Programs,Even now.I do a Special Jeff Healey Spot’ for (2) weeks,and a S/R/V Spot every other (2) weeks.From ‘Roadhouse the Movie’till now,I still find myself thinking about Jeff,and am still moved by all his performances.Thanks again for the great stories.Luv’ ya’ Work. Tecka’s Rock & Blues Show’ across Australia on CRN via satellite every Sat/Nite. You hit the nail on the head, Jeff will be deeply missed in my world and not to mention everyone who has ever heard this beautiful musician. Thank you Dave for giving us a glimpse of what it was like to have worked with Jeff. I could read these stories forever. I too love the pics of Jeff laughing. You can see his joy of life! I so wish I could have seen The Jeff Healeys Blues Band play. I love watching his videos and especially Healeys Hideaway. Keep up the great job of keeping Jeffs music alive!